Then simply try these quick to prepare summer salads from the food blog, goodnessis.com. You can let your creative side run free, as the ingredients can easily be varied. It’s also really good fun preparing them with the family, because kids like to choose what goes into their salad – as long as they are still healthy recipes. Try this healthy recipe for a classic salad, with a choice of two dressings. To make the croutons: fry the bread in a pan with two tablespoons of rapeseed oil, until it is brown on both sides. Then put to one side. 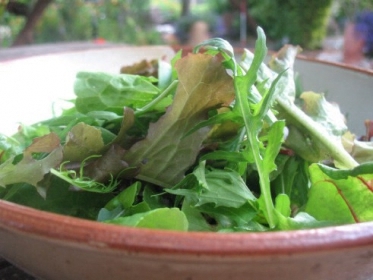 Wash the salad leaves thoroughly, and then tear the leaves into medium-sized pieces. To prepare the dressings, simply blend all the ingredients together in a food processor until the mixture has an even consistency. The dressings should be creamy and slightly thickened. Finally, season with freshly-ground pepper. 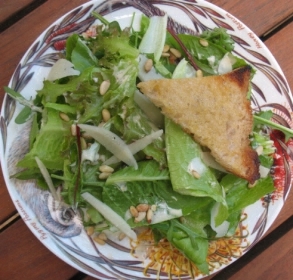 Then put the salad in a large bowl, mix in the pine nuts, croutons and the dressing, and garnish with the parmesan shavings before serving. Put the salad in a large bowl, toss with the dressing and enjoy!